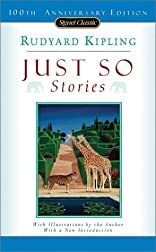 Just so stories for little children: illus. by the author. Just so stories. Vot tak skazki! S Illyustratsiiami Avtora. Na Angliiskom Iazyke. Special 100th anniversary edtion includes the author's original illustrations and a new introduction. Drawn from the wondrous tales told to the author as a child, Just So Stories creates the magical enchantment of the dawn of the world when animals could talk and think like people. 9/24/2009 Richele McFarlin said: I assigned this to my son for school last year for 3rd grade. He LOVED the book! I was thrilled to see my son enjoy good literature. This is a great book full of cute stories about how the animals are the way they are. "O, best beloved"... begins Rudyard Kipling in his wonderful tales of fun and enchantment about theanimals in India. They just don't write like that anymore. I don't have to read these over and over cause they live in my head. But when I do, I fall in love all over again. These are the series of How the Whale got his Throat, How the Camel Got His Hump, and 10 more. 10/9/2007 pixie q. said: In particular, "The Elephant's Child"